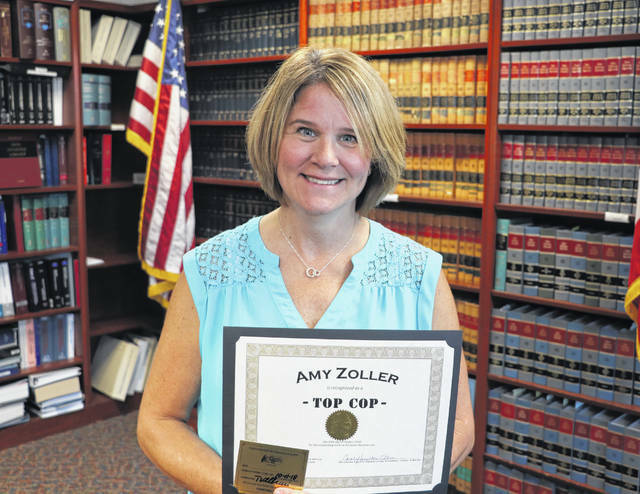 Amy Zoller poses with her Top Cop award. When Amy Zoller, a forensic nurse coordinator at OhioHealth Grady Memorial Hospital in Delaware, meets with a survivor of a sexual assault or domestic violence, she not only provides and encourages trauma informed medical care and treatment, she also plays a vital role in encouraging and facilitating the patient’s communication with law enforcement. “Nobody does this job for the recognition. We are passionate for those we care for,” Zoller said. Earlier this year, Zoller, along with Delaware City Police Detective Dan Madden and Delaware Police Officer Brett Simon, worked together on a case where a victim arrived at the hospital with significant injuries. The hospital team, led by Zoller, police and prosecutors, connected quickly and worked together over a 48-hour investigation, from the moment the survivor arrived at the hospital. From that close, connected work, a suspect was identified. After interviews and putting together a case based on the agencies all connecting and working together, a suspect was charged and later found guilty. That team effort led to the suspect being sentenced to 10 years in prison and an addition five years of post-release control. Zoller, and the others recognized, say this is a shining example of agencies that don’t always get to work together finding a way to communicate quickly and make decisions that led to a positive outcome in some of the most negative of circumstances. “We have to work together to make it happen, and none of this could have happened without that partnership,” Zoller said. It’s that team effort that led O’Brien to continue the Top Cop recognition four times a year.